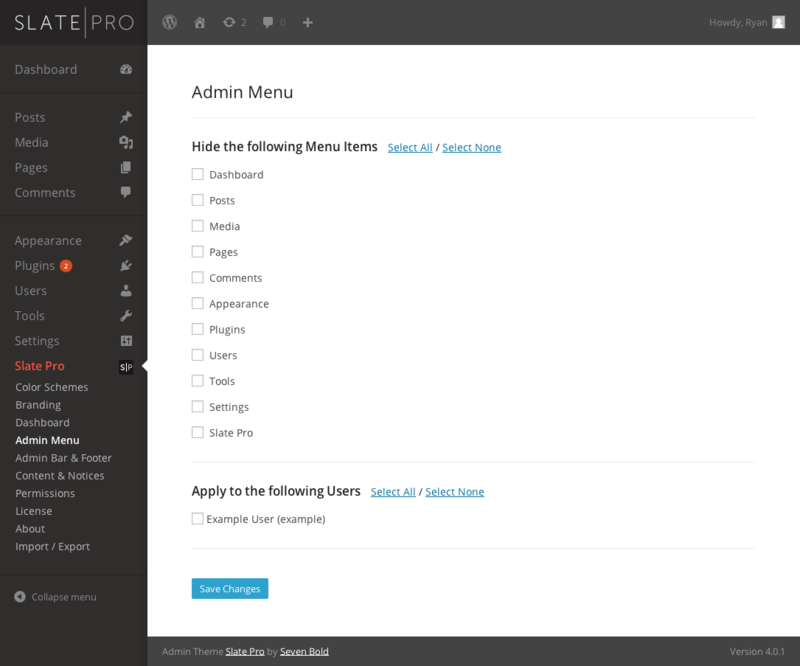 Slate Pro is a powerful WordPress admin theme plugin that reimagines WordPress with a clean and simplified design. White label your WordPress install with custom colors, a custom login screen, custom admin branding, and more. 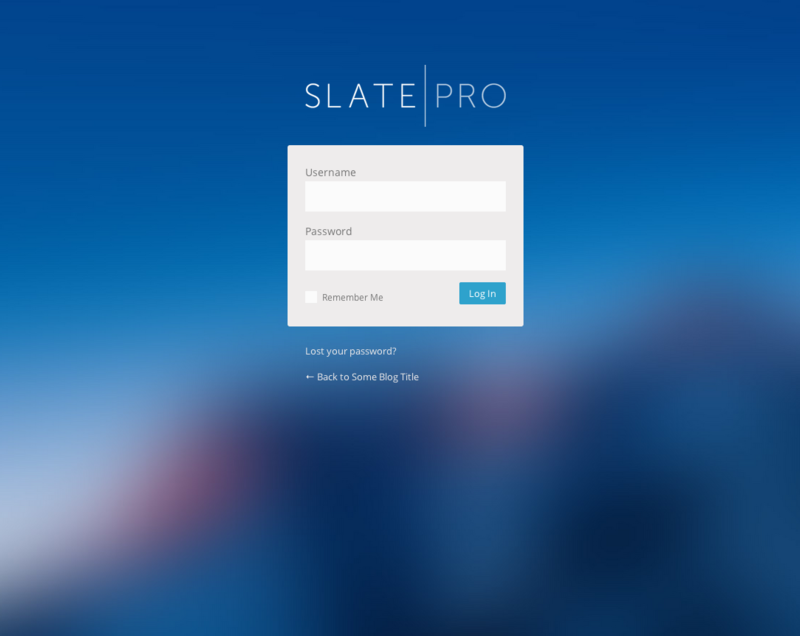 Slate Pro is now multisite compatible! Network activate to control the look of all sub-sites. 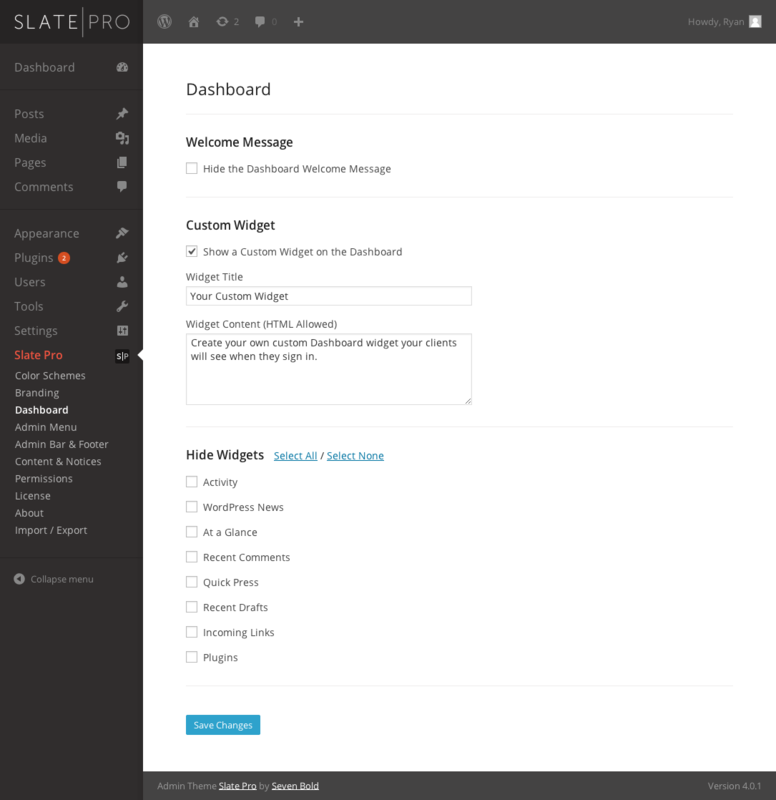 If you love Slate Pro please consider leaving a review here on CodeCanyon. Thank you! Completely customize all colors for a truly personalized and professional look. Users can choose from preset colors through their profile page. Hide the ability for users to choose their own colors. 8 Color Schemes included and more to come! Highlight your web design and development services! 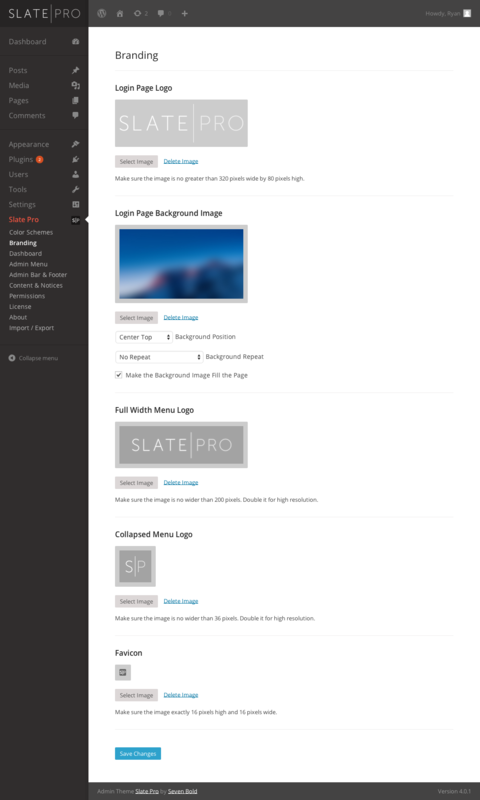 Add a full size and collapsed logos to the WordPress Admin Menu. Add a custom admin favicon. Change the logo link and title. Choose how the background image displays. Hide the default Welcome Message. Remove distracting, unneeded Dashboard widgets. Hide the Slate Pro Settings for specific users. Hide Slate Pro from the Plugins page for specific users. Hide just the WordPress logo from the Admin Bar. Display custom footer text with HTML support. Hide the Screen Options tab. Hide WordPress Theme Update Notices. 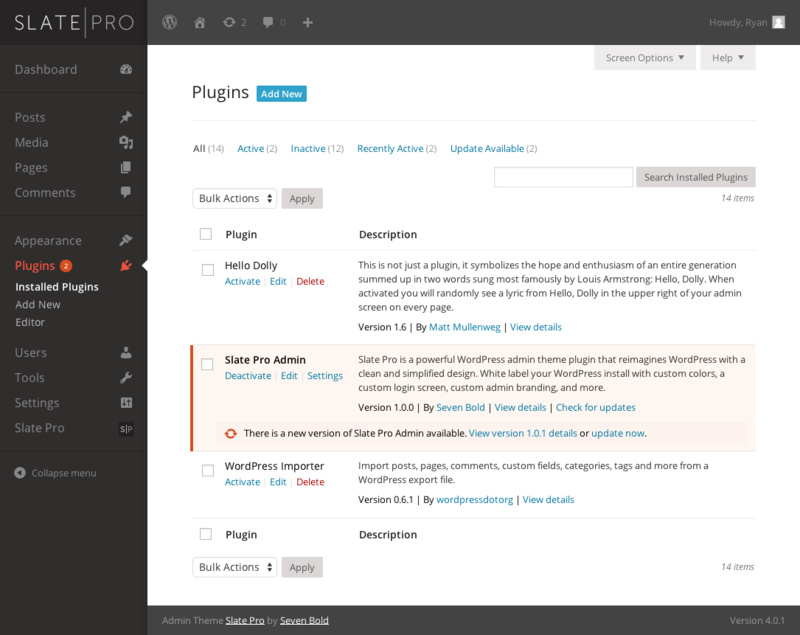 Hide WordPress Plugin Update Notices. Control look of all sub-sites. Network Activation requires only a single license key. Sub-sites can activate their own copies. Easily backup all your settings. Styling fixes for WordPress 5.1. Compatibility update for WordPress 5.0+ and Gutenberg. Compatibility update for WordPress 4.8 and 4.9. Compatibility update for WordPress 4.6 and 4.7. Compatibility update for WordPress 4.4 and 4.5 beta. Big update with lots of user requested features! You can now use custom url's for branding images. Admin Bar styling now shows on the front end of the site. Custom login url's now work on multisite installs. 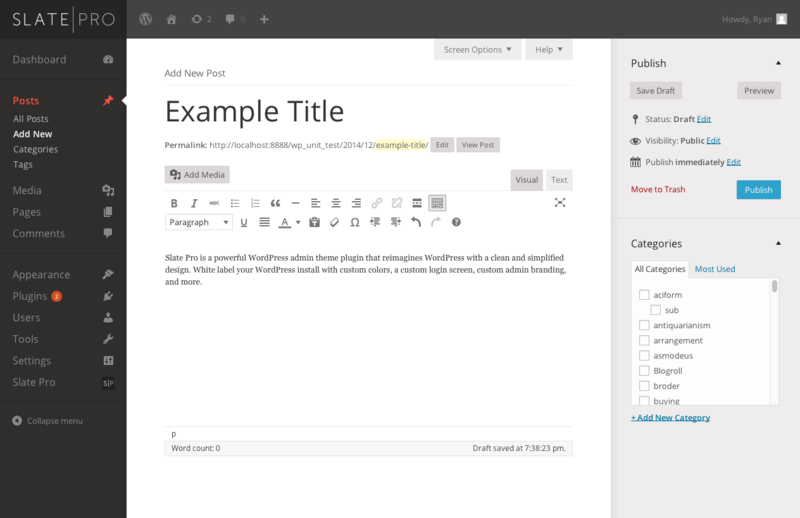 Added option to remove "WordPress" from admin page titles. Added support for custom login addresses on non-multisite sites. Added warning about losing settings when disabling plugin. Added alternative option for hiding update notices. This should help with speed issues. Added Title and Link fields to the Login Logo. Fixed invisible post titles for subscribers. Made the Admin Menu section work more reliably. Increased compatibility with other plugins. Refactored code and squashed bugs. 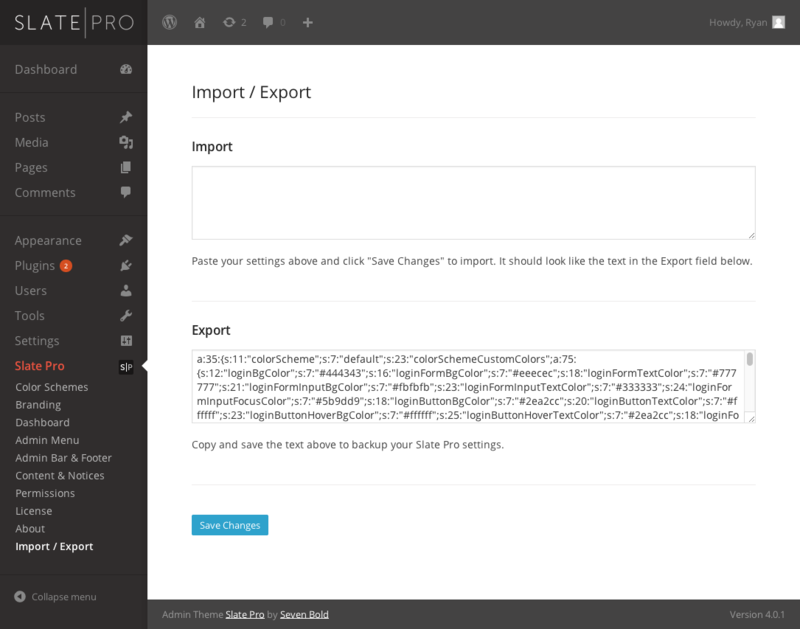 Increased compatibility with some 3rd party plugins and custom metaboxes. Added ability to hide the "Screen Options" tab. 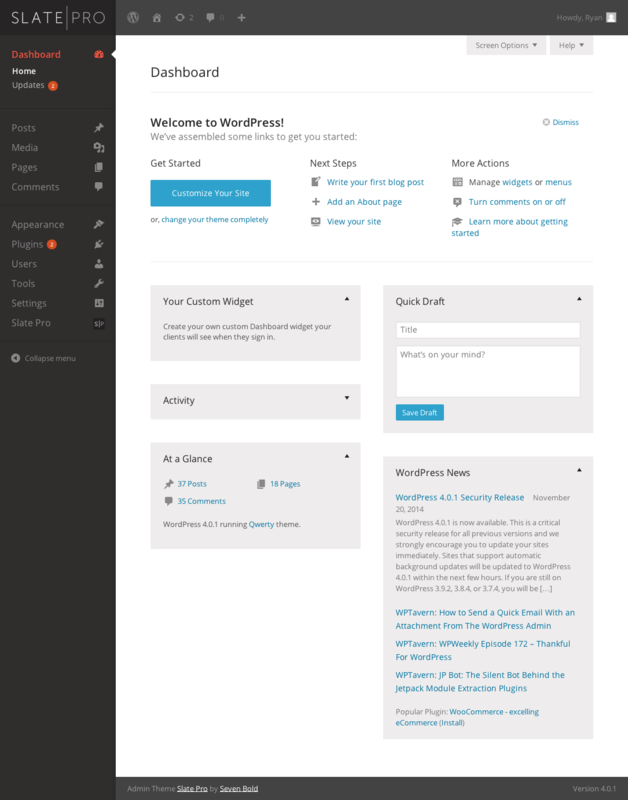 Updated for compability with WordPress 4.1.